Orca whale swimming in its underwater world, the Pacific Ocean. It is a special sight to see wild killer whales swimming in their natural habitat - the underwater world. Taken in the waters of Johnstone Strait in Canada's British Columbia, this picture shows the magical sight of these orcas looming gently and quietly towards us and then slowly move on. 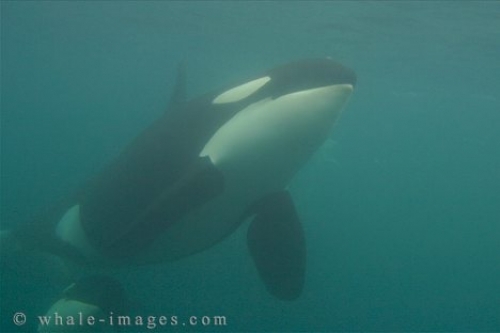 The underwater world that the orcas live in suspends their bulky figures and allows them to gracefully move about with ease. Picture of Orca Whale swimming in its underwater world, the Pacific Ocean off Vancouver Island in British Columbia, Canada.